It is a pleasure to welcome you to the thirteenth quarterly edition of ‘The Angels messengers from a loving God’ magazine. Thank you for your emails and letters. We are pleased you are becoming more acquainted with the nine choirs of angels and the Divine Mercy. Everything begins with the Divine Mercy and ends in the Divine Mercy. One of the best periods in my life was between 1992 – 1996. It was a tremendous grace for me to be chaplain to the Sisters of Our Lady of Mercy in Warsaw, and to stay under the same roof where St Faustina lived and where she started her religious life. She experienced the love of God and sensed His mercy in a mystical way. She had a positive and good influence on other girls and sisters in the convent. She prayed all the time in her heart to Jesus and was a woman of sacrifice and penance. As with other saints St Faustina did not have many friends. She preferred to be on her own spending time in prayer with Jesus. She was very obedient to do the will of God. Praying for the dying is part of the devotion with the Divine Mercy. St Faustina very much wanted to be with the sick and the dying to prepare them for their final confession. She knew the value of regular confession and especially before Easter and during the week prior to Divine Mercy Sunday. The cross is the throne of the Divine Mercy. The cross is a sign of God’s love and mercy. The cross is a wonderful present to give to someone as a gift. Jesus gave us everything on the cross; His blood, His mother, His clothes, His life. This is my blood which will be shed for you. I assure you of the constant prayer of the priests of the Congregation of St Michael the Archangel for all the readers and their families every day. I would kindly ask you to let others know about our magazine and distribute it all over the world. 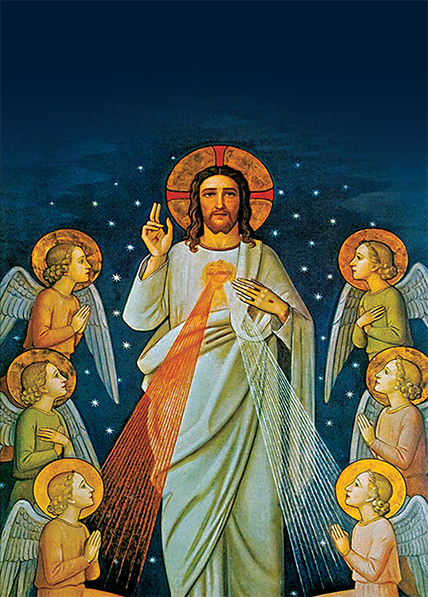 I would be interested to hear from you by letter or email and to relate any testimonies on how the Divine Mercy or your guardian angel has helped you in your life. This Year of Faith is a special gift from God, all that happens is because of Him. May Jesus the Divine Mercy, the King of Kings, the Lord of Lords, the creator of the world be in your heart and become the centre of your life each day.